After Hours" by this group with the highly unusual name has found favour with one or two Northern DJs but the flip If I Told You" is the one that gets my juices flowing. The gentle guitar figure that leads the singer in is just right but the singer himself is simply wonderful - gritty and oh so soulful. The chorus when the background singers come in really winds the tension up and then the next verse takes it back down again. The horns then come in and take the song right up to the top to the run out groove. Gorgeous. One to listen to time and again. 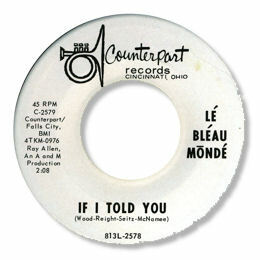 Arguably the best deep soul track on this Cincinnatti label. Could this group be white by any chance? UPDATE ~ My great friend Greg Burgess has confirmed that the group is indeed white, but the excellent lead singer is an African American called Charles 'Buddy' Woods. Greg adds that the group "recorded a slew of records as the Nutrons - you can read more about them here." Greg also reports that there are several tracks by the Nutrons on Youtube, including this one here which mentions the names of the band members. Yet more excelent detective work from Greg!